I've got something new to tell you about. AND, it's Tuesday. So there ya go. I love chipotle peppers. Basically, chipotle peppers are very ripe jalapenos that have been smoked to perfection! They add terrific flavor to certain recipes and I'm slightly partial to their sweet, smoky heat! It's ground chipotle peppers (looks sort of like chili powder) and it is W-O-N-D-E-R-F-U-L! I've heard about this powdered form of chipotle for a while but never remembered to look for it until a few weeks ago when I stumbled upon it on the spice aisle. 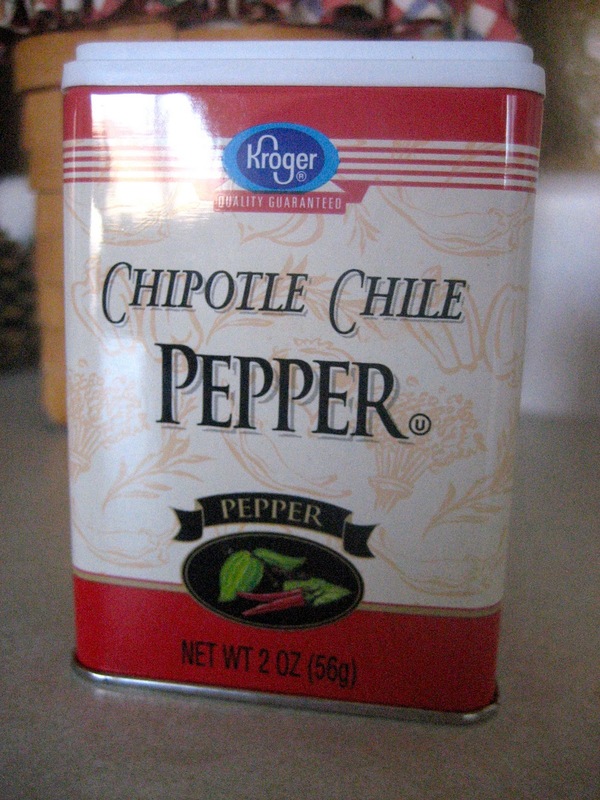 I'm guessing a bit here, but I think that 1/2 tsp of the powder is roughly equivalent to 1 chipotle pepper. Unfortunately there isn't an equivalent measuring guide on the can. I love spice but my family doesn't so this seems like an easier way to control the heat in certain recipes. I bought the above can at King Soopers (which is Kroger here in Colorado) for $1.99. I saw a can at Walmart for around $4.50, so if you have a Kroger close to you that's a much better deal! I'm sure there are lots of different brands, but I'm good with the Kroger one for now. I just ate breakfast, but my mouth started watering when I added those links. I bet yours will be watering now too. You're welcome. I will definitely have to look for this. I have a recipe for baked beans that calls for 1 pepper. I can't seem to find the cans, so I buy dried anchos & reconstitute them as needed. Another option. Thanks so much for this info! I'd never thought to look for this. I just opened a can of chipotle peppers last night to make those very burritos. And now I have a jar of the remaining peppers to use up so these recipes will be helpful. Having the spice on hand would be much easier to manage, though. I'm always inspired by your menus. I just bought a can, so I am thrilled to have some good recipes! The reason for my purchase is a recipe that involves chocolate chips with a pinch of chipotle melted over pretzels. Glory. I love these peppers and am going to look for the powder when I head to Krogers this afternoon!!! Now on to your recipes! 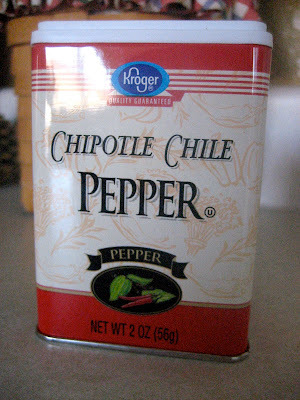 I love Chipotle peppers....I am going to look for that! Those recipes look YUM! I LOVE it when you put recipe links up!!! Thank you so much! I'll have to look for this! We don't have Kroger, but maybe my stores will have it. Have you ever tried Mrs. Dash Southwest Chipotle Seasoning Blend? Love it! I use it all the time. I'm definitely going to pick this up. My husband always makes chili and he LOVES to spice it up. This should make it yum! Sounds, uh, spicy! heh Actually, I do have ground chipotle for when I make fresh salsa in the summer. Or actually, used to - I found another one fresh that I LOVE so I'll probably just keep being lazy and buy it.